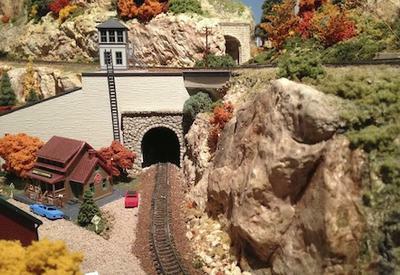 Building your first model railroad layout can be intimidating. Open any model railroading magazine and you will see page after page of pictures of huge, incredibly detailed layouts, which have been built by expert modelers or teams of expert modelers. Thinking about the hundreds or even thousands of hours it would take you to create anything similar - and with no guarantee of comparable results - is enough to put many people off from ever starting. Those who do get started on their own ambitious projects sometimes underestimate the time it will take, or hit unanticipated roadblocks and get discouraged. But don't despair! 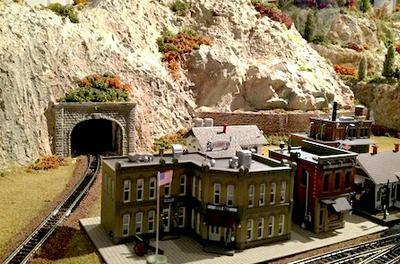 Model railroading is actually a very accessible hobby to the newcomer, and in this article we'll discuss a few ways to make your first layout inexpensive but still great-looking, and to maximize the chances of you getting it finished. 1. Start small. As I hinted at in the introduction, emulating one of the big layouts you see in magazines is a sure-fire way to fail as a newbie. A small layout will allow you to spend more time on details, so although it won't be huge, it will look great. Model railroaders are also constantly changing and expanding their layouts, so starting small doesn't in any way limit the potential of your layout in the future. You could design your layout from the start with possible future expansion in mind, but this isn't necessary - it'll just be a bit more work expanding it if you don't. 2. Consider scale carefully. HO scale is the most popular, and so has the widest range of products available. It's also generally the cheapest, as parts can be manufactured in greater bulk, and it strikes a happy balance between being large and so requiring lots of material, and being too small, thereby making production of fine detail difficult (and expensive). (If you live in the UK OO scale is most popular and might be your best bet, for the same reasons.) 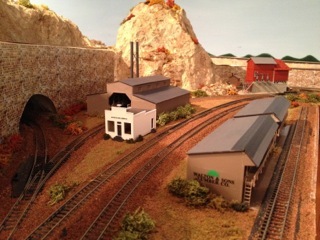 N scale is also popular, and may reduce your expenses bill for materials used for landscape building (as the layout will generally be smaller). Really the choice between HO, N and other scales comes down to what space you have available - but just make sure that whichever scale you choose has a sufficient range of reasonably priced items available for the era and location that you want to model. 3. Investigate unorthodox sources of materials. You'll be amazed what bits of 'junk' can be found at a tip which can be put to work on your layout. Your garden or the local park will have everything you need to build trees, grass and ground cover. Building sites often have unwanted insulation foam lying around that they'll be happy to give you if you ask, and this is ideal for building layered hills and landscapes. There are also a few things we suggest you steer clear of as a beginner. 1. Scratchbuild. Scratchbuilding is the art of building things from scratch, rather than from kits, and is a way to produce bits of scenery, buildings or rolling stock which aren't commercially available. It can also be a good way to save money, as buying raw materials will generally be cheaper than buying a finished product or ready-to-assemble kit. With that said, it's also time-consuming and requires considerable skill to get the finished article looking good, and is a great way to frustrate yourself as a beginner. It's also no longer necessary to get a realistic-looking layout, as many manufacturers offer very detailed and accurate pieces nowadays. Of course, if you're really confident and scratchbuilding is one of the aspects of the hobby that most appeals to you, don't let this put you off. Otherwise - you've been warned! 2. Kitbash. Kitbashing is the practice of taking bits from two or more ready-made kits and combining them to make a new model. As with scratchbuilding, it takes a bit of skill to get this right, so may be best left for after you've completed your first layout. 3. Buy poor quality track or rolling stock. Naturally you want to save as much money as possible on your layout, but buying the cheapest available track and rolling stock is not the way to do it! There's nothing more frustrating than a locomotive which doesn't run smoothly, either because of poor electrical connections in the track, or because of lower quality wheels or other faults with the locomotive. It's also a common cause of derailments, which will lead to more money being spent in the long run as your train goes crashing through your lovingly crafted scenery. Low quality track will need to be replaced sooner rather than later, further adding to the check. If you take just one tip away from each section of this article, it should be number 1 from the 'DO' section, and number 3 from the 'DON'T'. If you take my advice about starting small to heart, you will finish your layout, and a small layout where you can actually run your trains in realistic surroundings is infinitely more satisfying than a large one which is forever a work in progress. You also won't really know if model railroading's for you until you've finished at least one layout. As for buying high quality track and rolling stock - just trust me on this one. It will save you untold heartache and frustration down the (rail)road. Finally, many more tips like these are available in Mark Harrison's free eBook Model Railroad Planning for Beginners. In around 10 pages Mark takes you through the whole process of planning and preparing to build your first model railroad, without assuming any prior knowledge of the hobby. Go to www.hobbyrailroader.com to grab your free copy now. Starting Small is great. It would definitely be pretty easy to create a layout that you could just add a track or two to expand it into a larger layout. 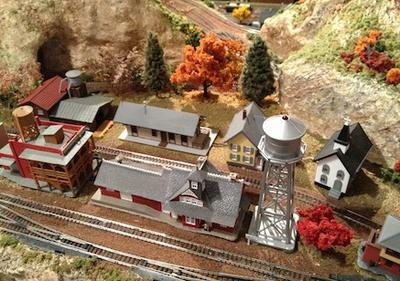 I know the train club south of us has each member create a 2 foot or 3 foot square layout that they can all connect with each other's boards. Cool stuff. Thanks for this artice, great for beginners!! A great article for beginners. To comment on scratch-building (both in response to the article itself as well as the first comment), there are pro's and con's for the armature modeler when it comes to "making it your own". In many ways, you are already scratch-building when you are designing your layout. From the elevation changes (if any), track positioning, scenery, and so on, these are things the modeler is doing on their own. Buying one or two models and painting them won't diminish the originality of the layout. In fact, sometimes the models look better than what you can make on your own. That said, scratch-building structures can be quite fun. For example, I love the scratch-build my own bridges to mimic old stick-build bridges. Buying craft sticks and dowels, cutting them to length, and staining them to look like old logs is a quick project that doesn't require exacting detail. Just know your skill level and start small. You don't need to have any type of buildings on your layout at first to enjoy it. Seeing a train speeding through open plains or dense forests is just as exciting as when it reaches the "future destination" of a town. I dis-agree with your scratch building comments. I think scratch building is a great way to really "own" your layout. If you have the skill and patience to put together a kit I think you can build from scratch. The key is getting good plans. I've just finished my third scratch built building. After you've done a couple you get a lot better and the process gets easier. I'd also much rather spend $10 for a structure than $85, and I can put the savings into rolling stock.